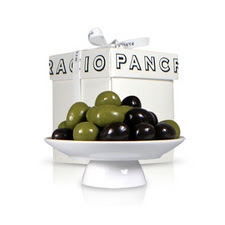 I was so excited to find these chocolate covered Spanish olives online. I remember really enjoying Chuao's rendition of the chocolate olive at a NYC Chocolate Meetup that was suprisingly yum. Turns out, these beauties from Spain based Pancracio are really just hazelnuts bathed in white and dark chocolate. That doesn't take away from the fact that they're beautifully presented. Would love to get my hands on a box, only seemingly they're just shipping to Europe. Frown.